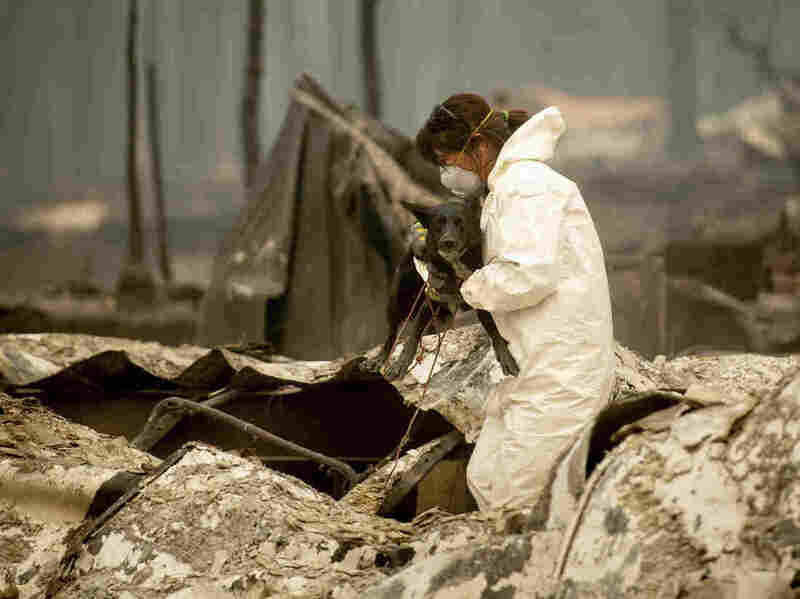 Camp Fire Missing-Persons List Grows To More Than 300 Names At least 56 people have died in the Northern California blaze, which has destroyed entire neighborhoods and continues to burn. Meanwhile, Butte County says about 300 people are missing. The missing-persons list has fluctuated in Butte County in part because of the confusion of a mass evacuation, the county coroner's office tells NPR. On Wednesday, the list had totaled 130 people. But the number has more than doubled, as friends and loved ones who had waited to report someone missing have now contacted authorities, the office says. At least 56 people have died in the Camp Fire — the deadliest wildfire in state history and among its most destructive. The fire has torn through the northern town of Paradise, laying waste to some 140,000 acres (nearly 220 square miles). When Gov. Jerry Brown visited the area east of Chico, Calif., on Wednesday, he said, "This is so devastating that I don't really have the words to describe it." "It looks like a war zone," Brown said. "It's the devastation that only fires of this kind can bring about." The White House said Thursday that President Trump will go to California on Saturday and visit with people affected by the fires. His itinerary hasn't been announced. The fire in Northern California is now at 40 percent containment, a week after it started. Since Nov. 8, it has killed 56 people and destroyed 8,756 homes. Fixed-wing aircraft and helicopters are working with ground crews to slow the fire's progress. "The fire remained active overnight and firefighters continued to use various suppression tactics to attack the fire," the state Cal Fire agency said. A large western chunk of the blaze is now contained, and firefighters' lines of control are strengthening, Cal Fire said. Authorities say they expect full containment by Nov. 30 — two weeks from now. Paradise was a quiet town of about 26,000 residents, located in the beautiful foothills of the Sierra Nevada. Now, it is largely a wasteland of burned-out rubble and charred vehicles. As NPR reported Wednesday, "The grim search for human remains in still-smoldering rubble has been aided by the arrival of almost 300 search-and-rescue personnel, including 50 National Guard troops." The California Department of Forestry and Fire Protection has produced an online structure status map of Paradise and its surrounding areas. Residents can check the status of their homes and view photos of any damage, without putting themselves at risk by entering active fire zones. 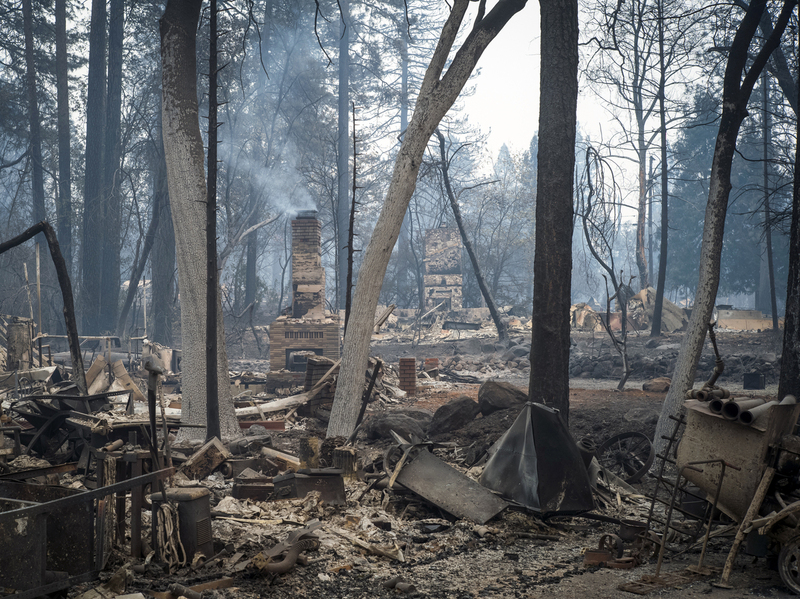 The fire about 500 miles to the south of Camp Fire affects parts of Ventura and Los Angeles counties and has killed at least three people. At 98,362 acres (154 square miles), the Woolsey Fire is 57 percent contained, authorities said in a news release Thursday morning. The fire, which started one week ago, is expected to be fully contained by Monday. It has destroyed 504 structures, and 57,000 others are threatened. Winds are expected to come down, so firefighters "will pursue opportunities to build and improve direct line to minimize further perimeter growth and support containment objectives," authorities said. "Fire suppression repair teams are actively engaged working around the fire perimeter and affected areas." Nearly 4,000 personnel and more than 575 fire engines are working to combat the flames. Cal Fire says the weather should help firefighters gain more control of the fire on Thursday, with lower temperatures and higher humidity levels expected. Portions of Malibu and Calabasas have been repopulated, as well as the entire communities of Monte Nido, Malibu Lake and Topanga. Currently at 4,531 acres, the fire, also in Ventura County in Southern California, is 97 percent contained. "Fire crews continue to mop up and patrol the fire perimeter. For tonight, winds are expected to be weak with northeasterly winds across the ridges and drainage winds at lower elevations," authorities said in a news release Thursday. Fire suppression teams continue to work around the fire perimeter and affected areas. A total of 40 personnel are at work. Just two buildings have been destroyed. Authorities say they expect full containment by Friday. Both the Camp and Woolsey fires started in areas where electric utilities had just reported problems, and state fire and utility officials say those incidents will be taken into account as they investigate potential causes. But while the official cause of the fires remains uncertain, there's little doubt that they benefited from weather that's drier and hotter than in the past — and that those conditions are a perilous mix when combined with forest land that has built up large stores of fuel over recent decades. "It's not just one thing," NPR's Kirk Siegler says. Noting forests like the Tahoe National Forest that sit just east of Paradise, he adds, "These forests need to burn to regenerate. But for more than a century now, people have suppressed wildfires." Pair that fuel with the changing climate that has exposed California to longer and more severe droughts and the results can be — and have been — catastrophic. "The foothills around Paradise should already be well into the winter rainy season," Siegler reports on Morning Edition. "But it's been more than 200 days since there was even measurable precipitation." It's a situation that fire managers have been warning about for years, Siegler adds. And as the governor said Wednesday, there are no easy answers for dealing with the huge and devastating fires. "We're going to have more difficulties," Brown said. "Things are not going to get better, they're going to get more challenging.